Hmm, on the subject of better straps. I think I am going to modify rEvolve design (https://www.thingiverse.com/thing:2646572), and use it for my Pimax, although it might be a while (backer in the lower 5ks). Should be rather easy actually, I just need to just modify the part that connects to the headset. in general this should be doable. Hopefully my measurements and guestimates are correct, so that the top mounting point “simulation” i made doesnt need more changes. Since I have a DAS already, I find it easier just to reuse it, especially since the headphones are already on it. Looking forward to this going up on thingiverse…I have a 3d printer and DAS and pimax 5K+ coming eventually! Any plans to sell this adapter? How about donations ? You are working on something that a lot of us would appreciate. 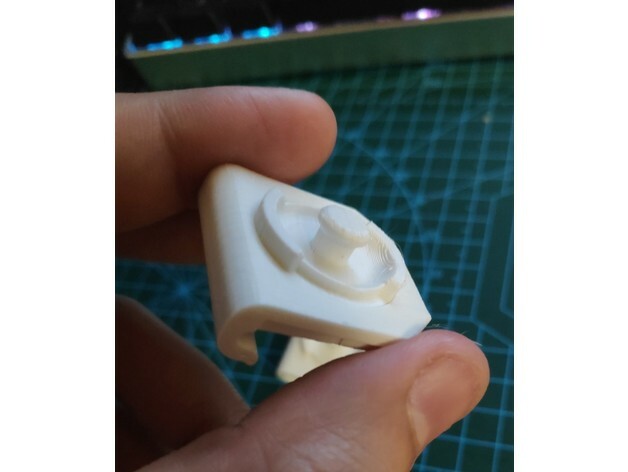 If I can print it properly with ABS (and I think I will, LOT of experience of ABS printing), I will send those DAS adapters for the forum users (edit. in need), with @Menithal s permission of course. As said earlier, once done, I will be providing the model as CC A NC SA License. Although I am still thinking specifically about the NC part, since I dont want people selling the stuff on ebay or stuff like that, reserving it to what I would do, but I would like people to order it from who ever is the closest printer as well. it held up even if it is such a tiny piece. unfortunately, I seemed to have accidentally inversed the outline, so the internal size of the loop is too small for the DAS loop, so going to be doing some tweaks. However this means the assembly will hold quite tightly, and is the correct direction once I get the simulator nailed down. Now need to adjust some values. Looking good! Now we just need you to get your Pimax so that you can fine tune it! What’s going on with this project? Any progress being made/has anyone actually tested this with a Pimax headset yet? It costs like less than $10 to have something like this 3D printed and shipped to you, total. Depending on where you live, you might even find someone locally on Thingiverse that you can pick it up from same day. Does anyone have their pimax already? I have a 3d printer and can send you some printed in PETG or PLA who thinks they can revise it or at least suggest how it needs to be adjusted, just pay for the mail (usps first class should be fine). I have not yet received my pimax but I got the choice a week back. Still waiting though, their projections say I should have mine by Early December. @michaelnyden I have Pimax, Vive DAS, and I’d love to pay for the mail through paypal, but I am in Shanghai. Could you send it to China? I will print the parts tonight. Sending it to China might be more expensive though. Are you comfortable being able to measure and offer suggestions/modifications to the original creator of these parts/model? @michaelnyden , that’s truly kind of you. I would definitely report my experience of the printed adapter and make suggestion for improvement. Just I am not sure how accurately I can measure and describe it with its quite complicated surfaces and structures.